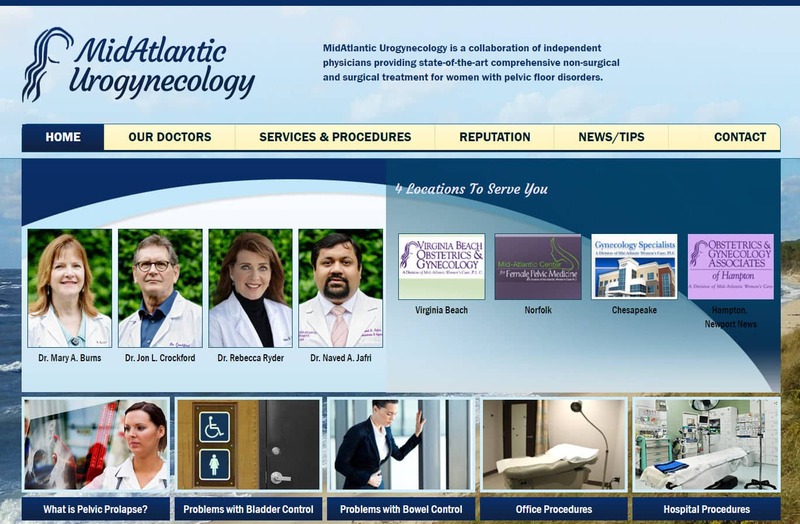 Website Design Medical Practices Norfolk VA | Mid Atlantic Urogynecology is a responsive, mobile ready medical practice website design for Urogynecology practice in Virginia Beach, Norfolk and Chesapeake VA. This is a custom designed Word Press CMS website. When searching Website Design Medical Practices Norfolk VA look no further than the web design experts at VISIONEFX. We provide website design services for a wide variety of medical specialties throughout Hampton Roads, VA.
Get a perfect website design for your business brand. VISIONEFX has great Google Reviews from verified customers posted on ‘Google My Business pages’. We invite you to read our reviews and contact our website customers. They will tell you our web design and web maintenance services are second to none. For great branded website design please inquire further using our online contact form.